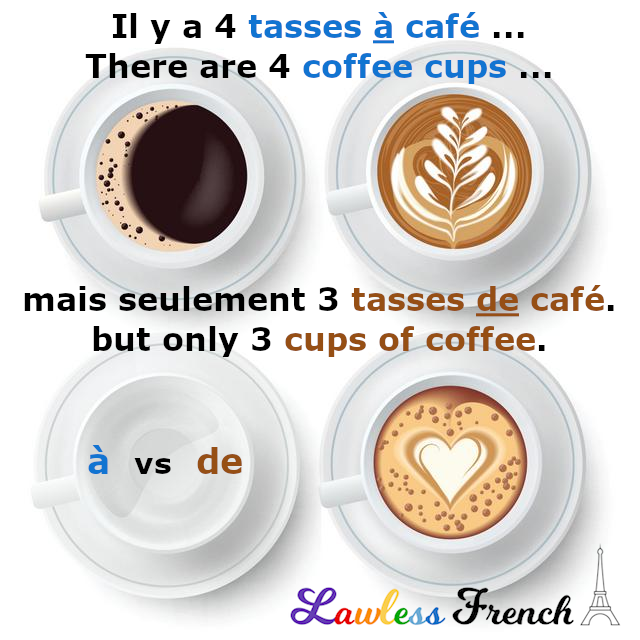 As if the myriad possible translations of à and de aren’t enough, these two French prepositions also have complementary and contrasting uses. Il est à Lille. He’s in Lille. Il est de Lille. He’s from Lille. Il va à Nantes. He’s going to Nantes. Il part de Nantes. He’s leaving (from) Nantes. Le café est à 10 minutes … The café is 10 minutes … … du magasin. … from the store. J’habite à 2 km … I live 2 kilometers… … d’ici. … from here. 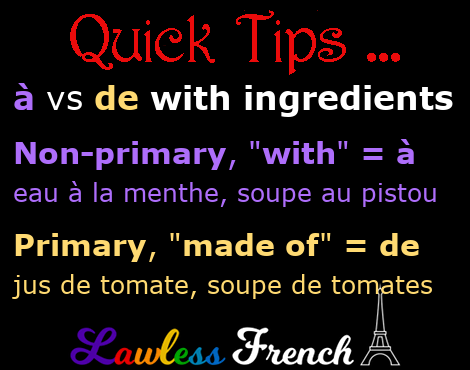 function, "for" contents, "of, with"
one of several, "made with" primary, "made of"
i’m very confused about the à vs de usage with ingredients. do you have any more examples? a chocolate chip cookie, for example… bisquit aux pepites de chocolat? chicken broth: bouillon au poulet? Chocolate chip cookie = un biscuit aux pepites de chocolat, because chocolate chips are only one of many ingredients. Chicken stock = bouillon de poulet, because you basically make it by boiling a chicken, that is the sole or primary ingredient. I had some troubles understanding why they use ‘à’ for ‘salle à manger’ and I asked it in duolingo and my friend there linked me to your post. so great that you had the exact example here. so great and convincing as always.